As I’m sure many of you already know, learning to juggle is associated with greater gray matter density in parts of the brain that control motion perception and hand-eye coordination. Not juggling for a long time tends to lead to the brain reverting back to “normal”(though some evidence suggests some brain changes are retained). Juggling is a highly interesting tool to investigate neuroplasticity associated with motor-learning. Several brain-imaging studies have reported changes in regional brain morphology in visual association cortices in individuals learning how to juggle a three-ball cascade. However, to our knowledge there are no studies that investigated expert jugglers, looking for specific features in regional brain morphology related to this highly specialized skill. Using T1-weighted images and voxel-based morphometry we investigated in a cross-sectional study design 16 expert jugglers, able to juggle at least five balls and an age- and gender-matched group of non-jugglers. We hypothesized that expert jugglers would show higher gray matter density in regions involved in visual motion perception and eye-hand coordination. Images were pre-processed and analyzed using SPM8. Age was included in the analyses as covariate of no interest. As compared to controls jugglers displayed several clusters of higher, regional gray matter density in the occipital and parietal lobes including the secondary visual cortex, the hMT+/V5 area bilaterally and the intraparietal sulcus bilaterally. Within the jugglers group we also found a correlation between performance and regional gray matter density in the right hMT+/V5 area. Our study provides evidence that expert jugglers show increased gray matter density in brain regions involved in visual motion perception and eye-hand coordination, i.e. brain areas that have previously been shown to undergo dynamic changes in terms of gray matter increases in subjects learning a basic three-ball cascade. The extent to which transient increases in beginners and the differences in experts and non-experts are based on the same neurobiological correlates remains to be fully elucidated. This isn’t that surprising. Similar brain changes can result from learning to play an instrument or learning to dance. Now if only they would do some research on joggling! This entry was posted in Juggling and tagged brain research, expert juggling brain, gray matter, juggling and the brain, juggling brain, juggling brain plasticity, juggling gray matter, juggling neuroscience, juggling research. Bookmark the permalink. When you are “joggling,” which activity do you consciously attend to the most, the running or the joggling? That’s a great question, Constance, and welcome back! Generally speaking, as a now “experienced” joggler, the juggling isn’t really a separate activity to me anymore. It’s just a natural extension of my running. I’d say I attend to the running more, since it sets the rhythm for how fast and how high I juggle. I also expend more energy on the running. In a way, the juggling isn’t really that different from how runners swing their arms while running, it’s just a little more complicated. However, if I am doing juggling tricks while joggling, I have to focus on the juggling more. 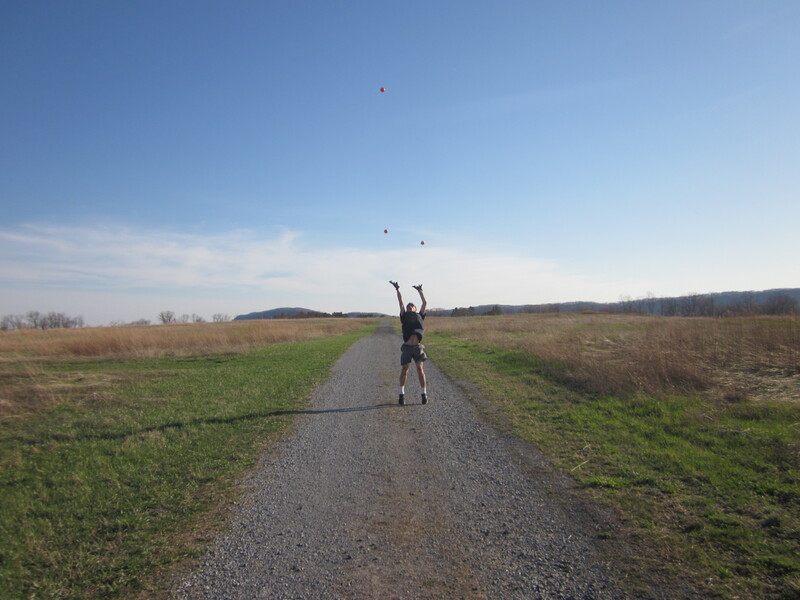 Also, when I started joggling, I had to focus more on juggling than running. I think the same is true for all beginning jogglers. Once you get used to it, once everything is deep in your muscle memory after many months, you may even forget you are even juggling while running. It’s really not that different from dancing the tango or ballet the more I think about it. I hope this answers your question.